I wanted to thank everyone who complimented, petted or otherwise admired my service dog in training, Sunnie. You made her first con a wonderful one. 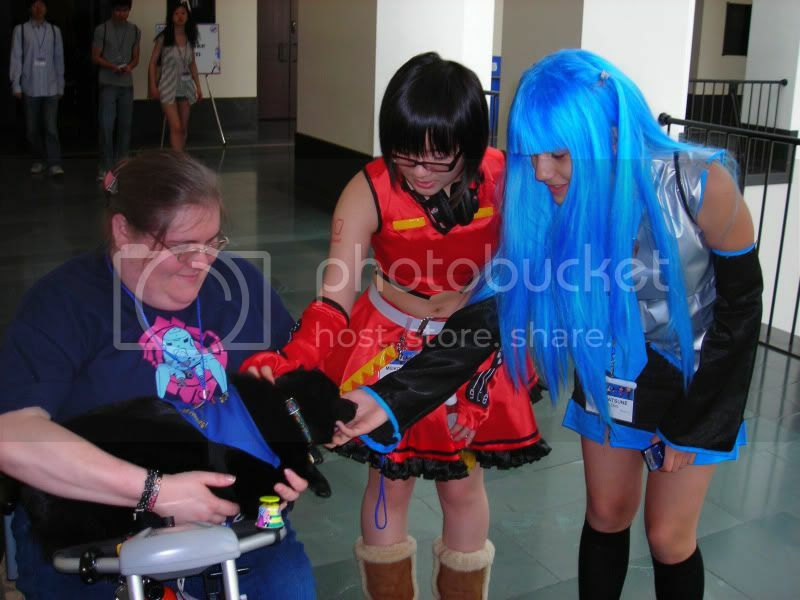 Here's a great picture my husband took of some cosplay puppy love. If anyone else has pictures of Max (current service dog), Sunnie and I, I'd love to see them. Re: Aww, it's a puppy!! How was your experience with bringing your service dog in training? I'm hoping to bring mine next year but i am very nervous because he will have never been to a convention. So I just wanted some insight about how it was. Hi magicatt, I just wanted to say hi and tell you I had the pleasure of meeting you & Sunnie at AB in 2013. Thank you for giving me the opportunity to pet Sunnie. She's a very sweet girl. I had also met you in 2012. Was Sunnie with you then too? If so, I loved how, after I first met her, she'd jump about and get all excited when she saw me again. Again, thank you, and I hope to see you again soon.